We tried on a selection of these jacket and we think they fit as expected. Choose the size you normally wear in men’s clothing. The rain jacket is over-sized to fit over the thickness of a riding jacket. When in doubt, choose larger. Dainese says: The Dainese Rain Jacket packs down into virtually nothing so slipping it under a pillion for inclement weather is a no-brainer. 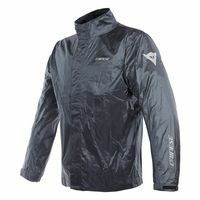 The waterproof fabric pulls double duty as a windbreaker for colder morning or evening rides.